“Mobility measured crudely in terms of how many kilometres we move around every day has nothing whatsoever to do with quality of life, rich human interaction, satisfaction, happiness and a detailed knowledge and familiarity with places and the things we chose to do in those places.”Our roles as transport professionals or campaigners are always related to the assumption – however unstated that assumption may be – that mobility is, in itself, inherently desirable. It is, like all background assumptions or cultural themes, so deeply seated that only careful analysis will suffice in assisting us in understanding what modern transport thinking is about. And when I say “transport thinking” I mean not just that of transport professionals (highway engineers, transport planners, road safety professionals, land use planners etc.). Indeed, the current assumptions we have about mobility are so wide reaching that they impact on just about every corner of modern life. This important and necessary book is exactly what we need to help put questions probing so many areas of modern society, as well as those immediately concerning transport professionals. Why, for example, has the cutting of the fuel tax accelerator (at massive cost to the exchequer) gone without opposition in parliament or any real public debate? If we are really supposed to be concerned about climate change, why has a level of motorisation in this country been accepted which, if universalised, would mean no prospect of reducing greenhouse gas emissions with any existing or likely technology? Do we really value local community? Are we able to even talk about all the various depredations of contemporary car culture? In modern society, actually questioning the sense of entitlement to largely unhindered car usage is highly unusual. Some of us have tried to do so. John Adams has used the concept of “hypermobility”. With Adams and Mayer Hillman, Whitelegg carried out the key work on the loss of children’s’ independent mobility over just a short period of modern time: “One False Move”. But this kind of questioning has had little impact on actual practice, particularly in the UK. Indeed, this questioning of assumptions – I find myself using that word again and again because it is the key one – is discouraged by those in the “Smarter Travel” movement and elsewhere as unhelpful. I disagree. Stating what is wrong with car culture and the worship of mobility is necessary. The public, as well as professionals, can benefit from being made aware of the numerous ramifications of contemporary transport and associated policies. Biting this bullet is exactly what Whitelegg does here: I would argue that the Introduction and first two short chapters of the book are a “must read” for all transport professionals. In fact, it should be required reading for first year students on not just transport related university courses, but social science courses as the implications are so widespread. This is easily recommended because of the books concise nature and low cost as an e-book. Of course, concision means the arguments against the villains of the piece (Air pollution; Death and injury on the roads; Energy consumption; Climate Change; Obesity and related health impacts; Community disruption; Equality and social justice; Fiscal burdens) each of which gets a chapter, are necessarily brief. Nevertheless, each chapter is worth reading, if only to provide a basis for further study. Above all, this book sets down an alternative framework for us. 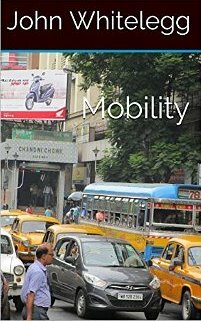 It is”…intended to promote the abandonment of the mobility paradigm and its replacement by something that maximises benefits to all sections of society locally and globally and minimises disbenefits. For convenience this is referred to as the accessibility paradigm.” A New Urban Design and Transport Planning Philosophy for a Sustainable Future: indeed. This entry was posted in Uncategorized on August 14, 2015 by rdrf. Pingback: The Mobility Complex: John Whitelegg lights a fire. | A post-automobile world? Is it possible to purchase a non-kindle version?? My understanding is that it is only available electronically, but I’ll enquire and if the answer is yes, I’ll get back to you.